Graham Bergh’s bamboo and recycled bike chain desk clock is a playful reminder that it’s time to ride. As you're sending emails, prepping for meetings, and putting the finishing touches on a big project, you've been sneaking peeks at your desk clock. Why? Because it's a playful reminder that it's almost time to ride. When the day is done, you'll hop on your bike and pedal your cares away. 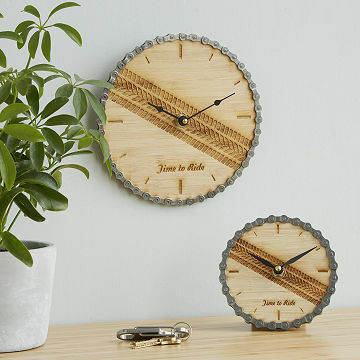 Even if you don't bike to work, the bamboo and recycled bike chain clock helps you celebrate your love for cycling. Place it on a shelf or mantel and start counting down the minutes 'til hitting the bike lane. Handmade by Graham Bergh and his team of artisans in Oregon. Exclusively at UncommonGoods. 3" W x 5" Dia. I thought this product was a constant reminder for my boyfriend to go and do what he loves best is riding his motorcycle. Great for desk use. Attractive and different to help you count down the hours. It is perfect for freestyle bicycle riders. Used to keep track of appointments. It's small enough for a crowded desk! Hand made, recycled, with love for the ride! Perfect for the desk at work. Can be stared at when yiu nedd a break and dream of the wind in your hair. VERY NICE UTILIZATION OF RECYCLED PARTS; BIKE CHAIN AND BAMBOO. My cycling friend loves it!